I love Christmas! The nativity displays, Christmas lights, Christmas carols, Christmas movies and the whole holiday season! Every year I tell myself I’m going to savor the time before Christmas, that I won’t let the days fly by in a super-sonic-seasonal rush, that we’ll spend afternoons reading Christmas books and baking cookies amidst the smells of our fresh cut tree and left over Christmas wreath cuttings. As soon as that happens, I’ll be sure to let you know. I’ll blog it – complete with pictures. And soft Christmas carol playing in the background. Until then I’ll just share one of our favorite Christmas traditions. For years we have enjoyed Playmobil Advent Calendars. They are a fun way to count down the days until Christmas. Playmobil produces a new calendar every year with a different theme. Each calendar comes with a cardboard backing that hangs on the wall. There are twenty four slots on the mat that hold small cardboard boxes. The boxes are assorted shapes and sizes and hold individual Playmobil pieces. As the days of December pass, a Christmas scene of Playmobil figures slowly comes together. One time it was a family gathered around the Christmas tree, another was a barnyard collection, and so on. One year I bought Joshua a Lego Calendar with Lego pieces in each window. The girls got a Clickit one. Joshua loved the Lego one but the $25 price was a little high. 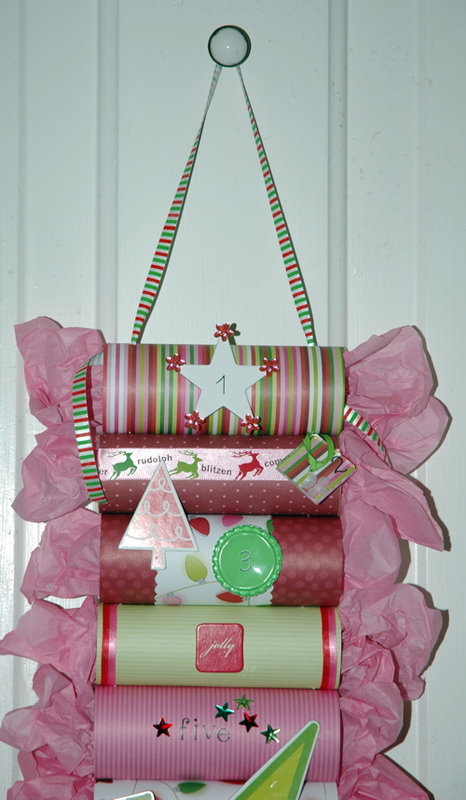 I fell in love with the idea – a Advent Calendar made out of coordinating scrapbook paper with ribbons and numbered tags. In pink and lime green, no less! Stop by Heather’s Blog for complete instructions and a gallery of pictures. I immediately began collecting small cardboard cylinders (okay, empty toilet paper rolls) and plotting my Advent Craft Assembly Project. In the end I modified the project some and came up with my own version. 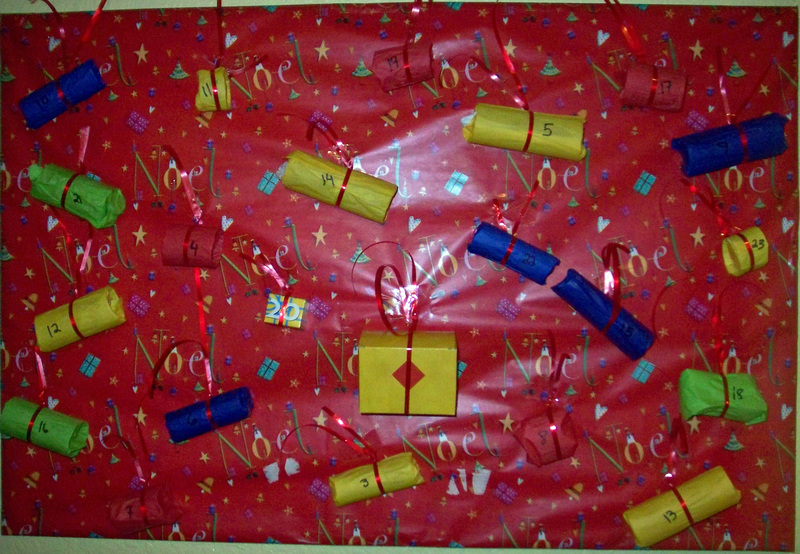 I covered a large picture frame with Christmas paper to use as the base. I slipped small toys (super hero figures, gum, coins, etc) into the tp rolls and wrapped them in bright colored tissue paper, tying a ribbon around each one. I numbered them 1 through 24 and affixed them onto the picture. 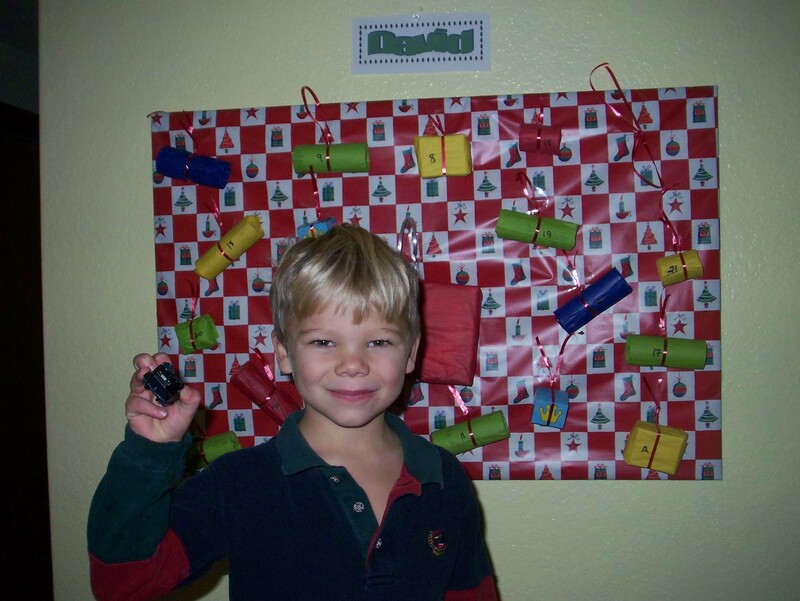 David and Daniel each had one of these big homemade Advent Calendars. Joshua and Sarah opened new Playmobil ones and Rachel received a month’s collection of Littlest Pet Shop figures in one of the older Playmobil calendars. I printed out name labels and pasted them above each individual calendar. We were a house FULL of Advent. Some called it over-the-top and slightly obnoxious, I preferred to think of it as festive. David loved discovering little treats on his calendar each day. This year I did NOT plan in advance. I don’t know exactly what happened. Maybe it was going away for the entire Thanksgiving weekend or just general Holiday Denial. Before I knew it, December was around the corner and I didn’t have a fresh Playmobil calendar or any goodies to go into a homemade one. And I hadn’t collected a single toilet paper roll. What to do?!? Of course, my darling husband suggested I skip the Advent Calendar Countdown this year. Gasp! Pass on a tradition? The thought of such a thing was repellent to my very nature. He was obviously overcome with pre-Christmas holiday trauma. It’s a common syndrome, usually involving credit card hot flashes and nausea. Persisting despite the setbacks, I set my course for Advent 2007. I did, however, have to make a few modifications. I didn’t have any small cylinder tubes, after all. Instead I decided to use the empty Playmobil Advent calendars from previous years. Tim and I went to the Dollar Store and Target to find little treasures. He cheerfully resigned himself to my obstinate persistent determination to do the Advent calendars this year. He’s awfully patient with me. 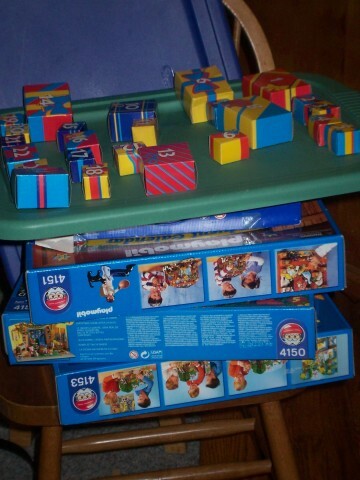 Of course, he also went to bed and left me to sort out the items, assemble the calendars with their 24 little boxes, and put together five sets of toys/goodies/treats. Let’s just say it wasn’t one of my earlier nights. I can’t do that kind of math this late at night. Maybe some traditions are meant for people with smaller families. I only have four Playmobil calendars so Joshua receives his gifts in his stocking. Many of the Playmobil boxes are tiny (remember Playmobil pieces are very small). If the present doesn’t fit in the box (a pack of gum or tube of window chalk), I leave a note in the box and hide the treat in their stocking or around the house somewhere. It’s been a HUGE hit! The kids beg to open their Advent box each day. Sometimes I am running behind and don’t have the gift ready. Oh the moaning and tortured wails that come forth from my beloved children. We’re working on developing patient attitudes. Next year I would like to, not only plan out the calendars in November (you know, before the December countdown actually begins) but also include the scripture verses that accompany Advent. A family calendar with daily activities, Bible verses, simple craft ideas and suggestions for ways to bless neighbors and friends would be AWESOME! Here’s one last link for another homemade Advent calendar. This type would work perfectly for my family countdown idea. A new tradition in the making, I can already tell. If you have any time left after reading this (way too long) post, head over to Rocks in My Dryer for other (hopefully less wordy) Works for Me Wednesday ideas. I’m truly sorry I didn’t post this Advent project sooner. Like, say in November when someone could have used the idea with their family. All I can suggest is to save the idea, bookmark the post, write a note in your Christmas planning book, and shoot for Advent 2008. Another option is – take a deep breath – do only ONE calendar and take turns. That would be a big comedown, I know, but it is an option! These are all great ideas! We don’t have an advent calendar this year, but I have usually just bought the ones where each day the kids get a piece of chocolate. I really like the idea of the cardboard cylinders though! I need to keep this in mind for next year! What fun! I have to be honest with you — I am completely and utterly exhausted at the thought of all the work you just put in to these. LOL It’s like I could go back to bed now. But, I am positive that this will be one of those special memories that your children will remember always. Wow! Love those. Very crafty. My kids love our advent calendar. It is the highlight of their day to run downstairs after they wakeup to move the next figure to the nativity scene. Precious traditions! The previous years I simply bought one of those chocolate advent calendars for my boys. We did the sharing thing – once. It was chocolate after all!!! Last year I bought three of them. Ugh. This year I bought an advent calendar through Oriental Tradings scrapbook store. It is made up of 25 small paper boxes. Assembly was VERY easy. Then I bought two bags of chocolate kisses & put three in each box (or other appropriate chocolate). They love it & it works great. I was going to put in other activities to do each day but December 1st really got here quick this year! LOL Perhaps next year I’ll do that. Maybe that will help you for next year! Oh my, OH, my, OH, my. Thanks for the ideas!! We LOVE our playmobil! But we only have the nativity and santa’s workshop. Cute! I think I giggled thorugh the entire post! You are one resourceful woman! Good job! 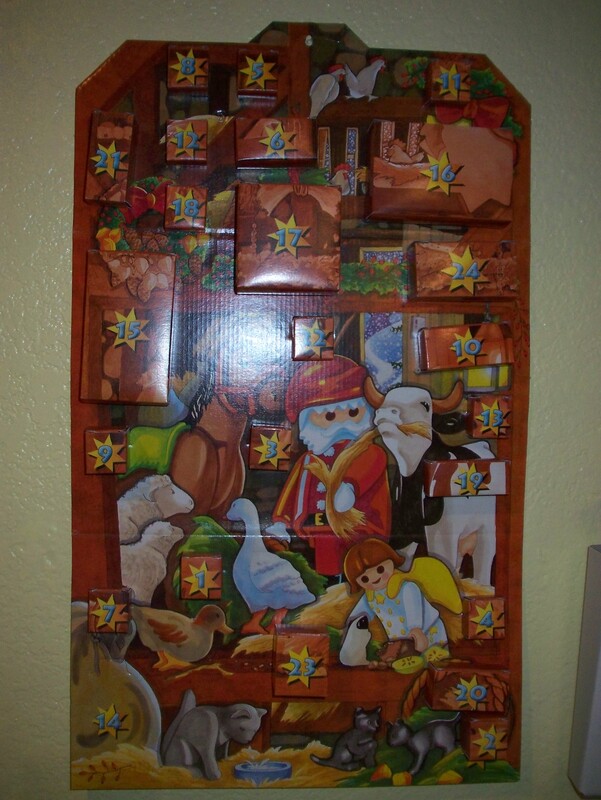 I love this idea, and I had no idea playmobile even had advent calenders! You do a separate calendar for EACH of FIVE children? Impressive! I’ve determined that my one Advent Calendar will suffice for my two children–they can alternate days or I can shove two tiny treats/notes behind each door. My hat is off to you, O Organized One! Whew!! I’m all for the more is better idea, but I haven’t really dwelt on all these exciting ideas. We do an advent calendar, but it’s one my mom invented. It’s a rhyming poem with a blank for each day, and the kids pick out the word that fills in the blank (my cousin illustrated the words for us). That word then gets taped to a tree we make from poster board every year. I love that they’ve almost memorized the poem, and that Jack thanks God at night that he got to “hang” the “ornament” on the advent calendar for the day. But it isn’t gifts. That would be thrilling!! And we light candles in the advent wreath and read the prayer book prayer for the week (another Kuhns tradition). I love the toilet paper roll calendar idea, but I think it would be fun to do as a 12 days of Christmas calendar. We used to celebrate the 12 days of Christmas growing up, although usually we just got a family present each day, a game or croquet set or just candy. Then, on the 12th day of Christmas, Jan. 5th, we’d have a special dinner and everyone got a gift. I remember at least once having a couple families over to celebrate the 12th night which was very exciting. But I’m pretty sure I could never be organized enough (or willing to forego sleep enough) to do four! Crazy! Maybe I could do paper towel rolls instead and fit four items in one. I love the combination of those pinks and greens–so bright and cheery. I’ll have to bookmark this one. CLUNK!!!!! That’s the sound of my chin hitting the floor. Kathy! Are you sure you aren’t twins? How in the WORLD do you find time to squeeze this in? What a fun tradition for your kids! I’m thinking I really have it together when my kids eat their yearly chocolate Santa candy Advent calendar that my sil/bil send, and we sit on the couch and read a Jotham book every day, lol! Oh, I just love Advent calendars and that pink/green was is the best! Thanks for sharing all your fun ideas!